The Crossfit Games Open adventures continue! 15 box jumps onto a 20 inch tall box. This is what went on in my head when I read it for the first time Wednesday night…”shoulder to overhead….ok….dead lifts…I got this….box jumps…no problem…wait…75 pounds? Frrrrrraaaaakkkkk”. 75 pounds for a push press is very close to my one rep max (done off a rack, not starting from the floor, nonetheless). Plus, how in the world was I going to even clean (pick up the bar from ground till it rests across your shoulders) 75 pounds if I have issues cleaning 55 pounds? I couldn’t scale down if I wanted this score to count. I had to do 75 pounds. Besides, I didn’t beat myself up in the first workout just to have the second score not count. My goal: To complete at least 2 full rounds, even if it took me forever just to get through the push presses. There was a lot of energy in the room, and I was shaking a little out of nervousness, but oddly excited. 3…2…1 beeped the clock, and I was off! As the 10 minutes wore on, the cleaning of the bar got harder and harder, requiring multiple attempts each time. The push presses started getting broken up into sets of two, then one….requiring me to clean after each fail. I was getting frustrated, and the sheer exhaustion after those box jumps didnt help me stay focued. But the yelling and screaming from my fellow crossfitters would not let me stop. I kept going back to that bar and I kept giving it everything I had left. In the end I managed 122 reps. That is, four full rounds plus two shoulder to overheads. Way more than my goal of two full rounds, and I am still amazed I got through four! When I started Crossfit a little over a year ago, I struggled to push press 55 pounds, and I had trouble picking up a 45 pound bar. And now look at what I just did. Progress! This same line of thinking also applies to me and Quiches. 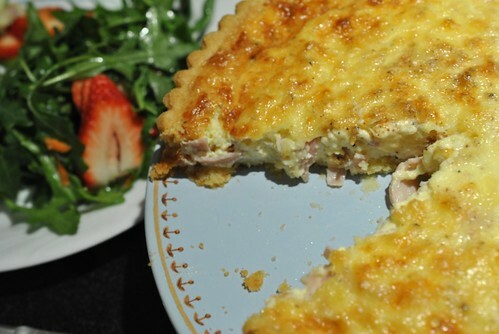 For the longest time, I was always wanted to make a quiche but was a bit too afraid to try. It was the crust. I have very little luck with crusts, so I was hesitant to try. And now that I did, I have come to realize that I am a lot more capable than I thought! Dump everything but the egg and egg yolk into a food processor with the metal blade attachement. Pulse about 20 times until the mixture resembles course pebbly sand. Add in the egg and egg yolk and pulse until it just starts forming a ball of dough. Turn out the dough onto a floured surface and form into a disk about 1/2 inch thick. Roll out the dough until it can cover a 10 inch tart pan. When rolling out the dough, make sure the dough doesn’t stick to the table by rotating a quarter turn after each roll and keeping the surface floured. Once it is wide enough, carefully drape half of the dough over each other and lift into the tart pan. Unfold and gently press the dough into pan and the edges. 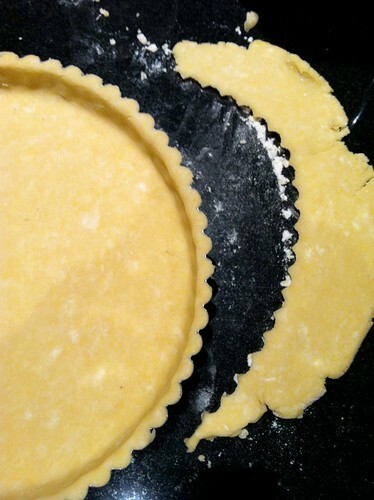 Use your rolling pin to roll over the tart pan to cut off any excess. 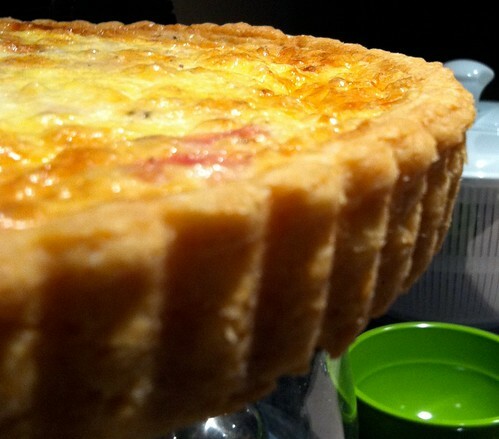 I used my excess and rolled out some to cover a mini pie dish to make a mini tart (which you can half the filling quantity and make more filling for the individual. Preheat the oven to 375 degF with a rack set on the lowest level. 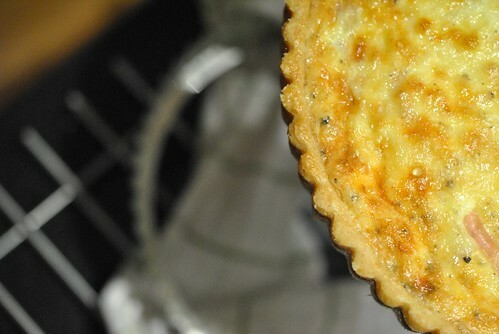 Place the tart pan over a sheet of aluminum foil on top of a rimmed baking sheet. My spilled a bit and I had it on top of a cookie sheet. The rimmed sheet will ensure that juice/liquid doesn’t end up on the bottom of your oven, like it did mine. 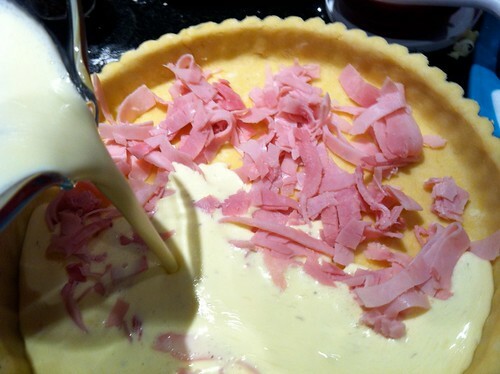 Sprinkle the ham shards over the bottom of the tart crust. In a medium bowl, or a 4 cup measuring cup, whisk together the milk and whipping cream and season with salt, pepper and nutmeg. Here you are supposed to taste it to make sure it’s just slightly overseasoned. All I tasted was cream, but I seasoned more than I thought I should and left it. Whisk in the eggs, 2 at a time. Pour mixture into the crust. Sprinkle top with the cheese. Put into the oven, on the lowest rack for about 30 minutes. The crust should look baked and goldenish, while the filling should be puffed up a little and set in the center. Mine took way longer than 30 minutes, and I pulled it out when it was just about set in the center (stopped jiggling when shaken). It could have used another 5 minutes. Let it cool on a wire rack until you feel comfortable handling it to unmold it. I ate mine with a simple salad of baby arugula, shredded carrots and sliced strawberries lightly tossed in a balsamic vinegar and olive oil vinaigrette. It was delicious freshly baked and warm. 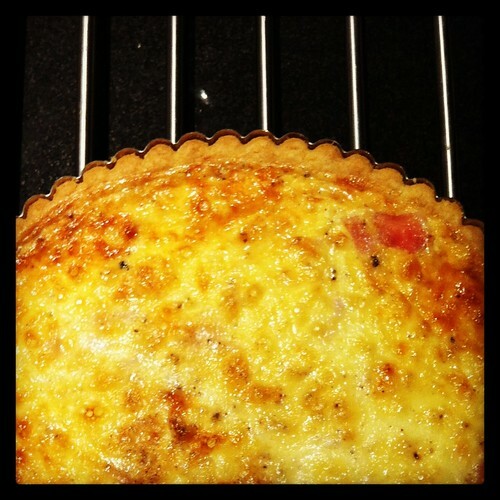 The crust was flaky and buttery and the filling not overwhelmingly eggy. Once it was totally cooled down, I covered the leftovers in plastic wrap and put it in the fridge. Two days later, I had another slice gently nuked at about 10 seconds and it was still delicious. And just to put into perspective how Crossfit has also improved my everyday functionality, last weekend I waltzed into Petco to buy my dog his food. I walked right up to the display, pulled out a 30 pound bag, lifted it up, tucked it under one arm, against my hip and calmly wandered over to the cashier. Put it down, paid, picked it up again and slowly walked back to my car with a 30 pound bag of dog food held against my hip with one arm. Is it weird that I get a kick out of politely waving the guy away when he offers to help me carry it to my car? 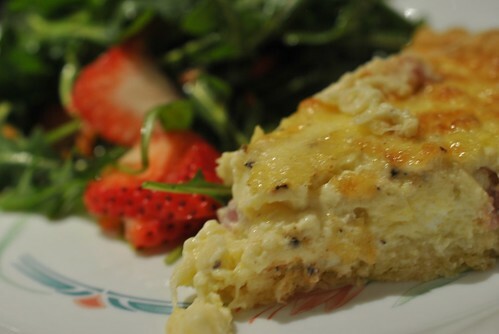 This entry was posted in Breakfast, cheese, CrossFit, Dinner, Salad and tagged Crossfit, Gruyere, Ham, Nick Malgieri, Quiche, tart, The Modern Baker. Bookmark the permalink.